Some nervous dental patients suffer anxiety attacks when having to visit the dentist. An understanding dentist can handle this by combining empathy, explanation and relaxation aids. We don’t always like what’s good for us. Perhaps you have a strong aversion to dental visits and put them off at every opportunity. Or perhaps you just push aside a nagging dental problem or the need for a regular check-up. The effect of such comments is to keep you out of the dental chair. But it has a price, because many dental problems develop without obvious pain. They hide their existence. If you delay a dental visit until you ‘feel something’s wrong’, you risk exposing yourself to treatment that’s more invasive, extensive, time-consuming and expensive! Every responsible dentist would rather catch a small problem early on at a low price than deal with a complex problem later on at a much greater cost. Where does fear of the dentist come from? You remember being coerced and hurt as a child by a dental experience. Your parents threatened you with going to the dentist (and experiencing its nasty consequences) IF you didn’t brush your teeth properly. You ‘hate needles’ anywhere – and especially in the mouth. You can’t stand the sound of the drill (especially the slow-speed one that seems to rattle your brain). 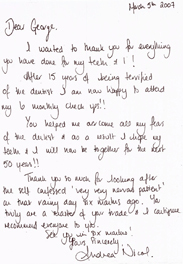 You’re convinced that the cost of dentistry will be completely unaffordable to you! At the end of the day, you want to keep your teeth fit and functional (maybe attractive’ too) for the rest of your life. It’s important to be treated by a dentist who’s experienced in dealing with problems of dental anxiety. Time is needed to carefully learn about the patient’s concerns, explain the treatment steps and be gentle in giving local anaesthetic where required. Sometimes a local anaesthetic cream is applied first to the gum area so that the needle is not felt at all! Being able to listen to relaxing or distracting music or watching a video during treatment is another way to shift the patient’s focus away from the treatment being done. Then there’s sedation with Relaxing Gas – which CAP City Dental provides. Relaxing Gas is a mixture of Nitrous Oxide and Oxygen which you inhale through a nose piece. It’s totally safe (women in labour use it) and lightly sedates you so that you’re detached from the sensation of treatment. Dr George Druttman has decades of experience with this technique and uses it on about 60% of his patients. The mixture of Nitrous Oxide to Oxygen is carefully adjusted to suit each patient. The effect with Relaxing Gas is to detach your focus. You still hear what the dentist is saying to you but you don’t focus on what the dentist is doing. Before you know it, the treatment is over. Once the nose piece is removed, you return to normal alertness within a minute or two. After a session or two, you begin to take dental treatment in your stride.